1 Wash the apples and dry thoroughly with kitchen paper. Remove the stalks and push a lollipop stick about halfway into each apple in their place. Transfer to a baking tray lined with baking parchment. 2 Pour the sugar into a large, heavy- based pan and warm over a low heat until dissolved. Carefully add the apple juice, maple syrup and vinegar and stir. Increase the heat, bring to the boil and cook for 7–8 minutes until the toffee reaches 140°C. To check, use a sugar thermometer or drop a small spoonful into a bowl of cold water — the toffee should set instantly. 3 Take the pan off the heat and stir in the sprinkle mix. 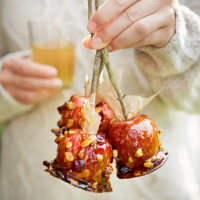 Dip each apple into the toffee, let any excess drip back into the pan then place on the baking tray. Repeat with the remaining apples. Leave to cool completely. This recipe was first published in Thu Aug 14 17:22:12 BST 2014.